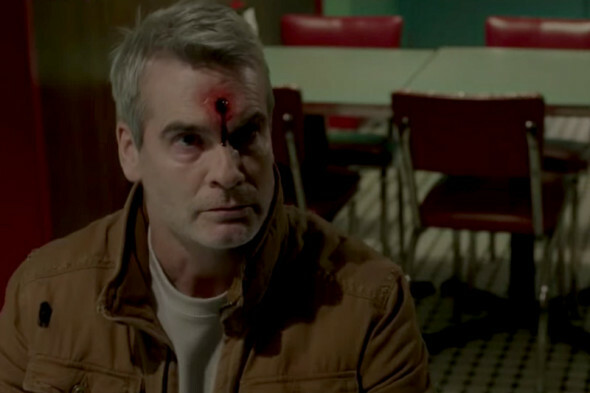 With a funny shuffle step and a blank stare, Henry Rollins announces Jack, anti-hero of the new indie noir/horror mash up He Never Died, as an odd sort. Jack, you see, has kind of always been here. The here in question at the moment is a dodgy one bedroom, walking distance from the diner where he eats and the church where he plays bingo. An exciting existence, no doubt, but this mindlessness is disturbed by a series of events: an unexpected visit, a needed ally with an unfortunate bookie run in, and a possible love connection with a waitress. Even if this sounds vaguely familiar, rest assured. This theologically confused but utterly entertaining tale of moral ambiguity, blood thirst, and eternity plays unlike any other film centered on an immortal. Writer/director Jason Krawczyk’s screenplay drops us in a middling criminal world populated by unimpressive thugs. Jack’s environment is refreshingly and entirely lacking glamour, Krawczyk’s concept uniquely quirky and low key. From the word go, He Never Died teems with deadpan humor and unexpected irony. Casting Rollins in the lead, for instance, suggests something the film actively avoids: energy. The star never seethes, and even his rare hollers are muted, less full of anger than primal necessity. Jack’s battle is not with the goons at his door, but with something higher and more confusing to him. This day to day bloodbath he perceives more as a nuisance, although there’s a tale of redemption bobbing just below the surface of all this blood. Krawczyk should be congratulated not only for the light touch he gives this thematic thread, but for the unexpected turns the film takes before embracing it. Rollins’s performance is strong, offering Jack as a solitary figure who clings to all things mind numbing as a way to pass the time without complication or human interaction. As a survival mechanism, he’s all but forgotten how to behave around humanity, a species he regards without needless sentimentality. While Rollins is the showcase, the supporting players around him add nice touches of eccentricity (Steven Ogg), resignation (Scott Edgecombe), and energy (Jordan Todosey). Particularly good is Kate Greenhouse as the film’s disgusted, completely frustrated conscience, Cara. It’s an unusual mix worth checking out. Plus, who hasn’t always wanted to see Henry Rollins eat a man’s larynx? Read Hopes Q&A with Henry Rollins HERE.